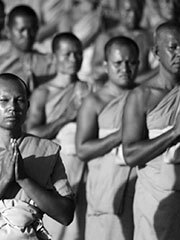 The adherents of Buddhism, monks and laypeople alike are known as Buddhists. Numbering over 350 million people, Buddhists spread all over the nations of South East Asia, the Indian subcontinent, China, Korea and Japan. Small Buddhist communities are also found in Western Europe and North America. The following is a comprehensive aspect of the dominant forms of Buddhism along with the primary regions with which they are associated. Theravada Buddhism: parts of India, Sri Lanka, Myanmar (where it is imposed as the state religion),Thailand, Laos, Cambodia, parts of Vietnam (along the Mekong Delta frontier with Cambodia, the so-called «Khmer Krom» region), and parts of China (in Yunnan, Guangxi, and Sichuan). Mahayana Buddhism: most of China (including Hong Kong and Macau), Korea, Japan, Singapore, Taiwan, and most of Vietnam. Tibetan Buddhism: found in Tibet (and adjacent areas of China), North India, Bhutan, Nepal, southwestern China, Mongolia and, various Constituent republic of Russia that are adjacent to the area, such as: Amur Oblast, Buryatia, Chita Oblast, Tuva Republic, and Khabarovsk Krai. There is also Kalmykia, another constituent republic of Russia that is the only Buddhist region in Europe. Shingon Buddhism or «True Word» Buddhism: found in Japan. At the present time the teachings of all three branches of Buddhism have spread throughout the world and are now easily available in western countries, and increasingly translated into local languages. It is believed that China is the only country where all of the major sects of Buddhism have significant numbers of followers.